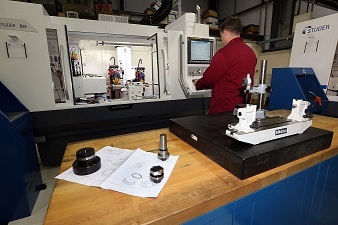 High-accuracy subcontract grinding is a significant area of work for GB Precision, which specialises in providing complex tooling solutions to customers in sectors from F1 to pharmaceuticals. With a rapidly increasing grinding workload, particularly in ultra-hard tool steels and carbide, the company has recently invested in a third, high specification Studer, an S31. One of the most appealing aspects of the S31 is its flexibility, with the ability to grind individual work-pieces as well as to handle small batch work, and, with a centre height of 175mm and distance between centres of 650mm, it is particularly suitable for tool-making as well as wide range of subcontract parts. The firm specialises in grinding complex forms, including thread grinding, so the Studer’s fine adjustment features, allowing the automatic setting of intermediate angles to a resolution of 0.0001degrees, are of particular benefit. In addition, the machine offers excellent dampening and thermal stability, which, operating in GB Precision’s air-conditioned tool-room, ensures optimum grinding finishes at higher speeds, with extreme accuracy and tolerance-holding capability. Paul sums up; “The S31, in our specification, can drive two rotary dressers set on the machine simultaneously. So we can now grind with larger, more powerfully driven CBN and vitrified diamond wheels to meet the increasing demand for high-accuracy grinding of very hard tool steels and carbide. That sort of work is not every one’s cup of tea, it requires specialist skills and equipment – and, at GB Precision, we have both.